Greetings, one and all. You may remember reading about our recent vacation in Wales and England in my last post, and maybe you also remember the fabrics I brought home. Two lovely bits came from Butterfly Fabric in Cardiff and the third from Brecon, where I was visiting family. One afternoon hubby and I walked into town and stopped in for a coffee, wandered around the touristy-shops, antique shops, real estate agents (well, yes of course, I always want to move there!) and ended up in an open market. Surrounded by the expected sights, sounds and smells (fish…..) of the market, we were surprised to stumble upon a woman set up at a long table piled with luscious cuts of fabrics! There were many beauties to choose from, but this Japanese cotton really captured my attention. Brightly colored, and highlighted with gold, this print was destined to become a kimono. Now there was only one teeny little problem with that plan. Kimonos require rather a lot of wide fabric. This was just 2 meters of 44″ width cotton (and it would surely shrink) and there was a 12-inch pattern repeat. Yikes. I might have been able to squeeze the pieces on, but not with any hope of matching. The sleeves and/or body would be shorter than desired. I considered adding a contrast border at the cuffs and hem, but the border would need to be fairly wide, disrupting the print too much. Also, I had been “wearing” the fabric around the house now and then to get a feel for it, and decided it really wasn’t the correct pattern/fabric match after all. What I needed now was not an actual kimono pattern, but one for a top with kimono sleeves! My internet search turned up several options, and the Wendy Ward Fulwood Dress/Top pattern was perfect, as it had no back seam. I made no pattern adjustments, other than to add 1 inch to the length. (Well, in the interest of full disclosure, after trying on the basted version I thought perhaps side slits would be – ahem – a nice modification.) I sewed it up using the black thread already in the machine, but then happened upon a golden beige spool while looking for my misplaced hem gauge. Serendipity! It was too late to re-sew the seams, and although it wasn’t topstitching thread specifically, it would be just perfect to topstitch the facings, cuffs and hem. And I’m so pleased with how it turned out. This is a casual top, but with the elegant print and gold details, it will be easy to dress up. Oh yes! A pair of gold lame cigarette trousers! Or maybe not – maybe just accessorize with a goldendoodle pup. Being one’s own photographer is not terribly effective. Now I would like to step away from my normal chatter for just a bit, if you don’t mind. It’s been my habit to apologize with every make, for the time and trouble it took for me to do something so simple. This lovely top, though, was quickly and easily put together. So when it was completed except for the hem, I simply hung it up and admired it for two days. Why? There was no logical explanation not to finish it in one short session. As I pondered my actions, it occurred to me that I was really enjoying the process, and this last bit, hemming, is just another piece of it. Each decision, each step, each moment of angst or accomplishment along the way deserved to be savored. Is this part of what the slow sewing movement is about? Beyond the environmental and social aspects, perhaps it also is necessary for one’s own peace of mind. Just let each project be, to come to fruition in its own time, to sit back and enjoy the process with no apologies. Or maybe I’m just finally growing up. And finally, Lynn, this is for you! Griff at 12 weeks. I think we may be in for big trouble with this little one….. 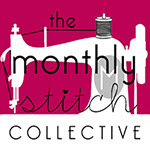 Happy sewing, and whatever method works for you, stitch on everyone! Sewing for fun and my daughter, wellness, creativity, with a bit of labrador and decorating! Remembering past journeys, recording current trips and planning for the next one! Adventures in dressmaking from an improving sewist! Sewing my way to a handmade home.